The full size SnapSafe Titan Closet Vault is a really nice modest sized fireproof home safe for guns, cash, checkbooks, and maybe even a little gold and silver. Priced at under $1000 (Now with FREE SHIPPING at Amazon! *) this safe is delivered to your door on a pallet by an 18 wheeler, but can be assembled all by yourself or maybe just a little help to make sure you don’t hurt yourself or bang up the woodwork. The paperwork and labeling on mine made it easy to tell the driver that I bought it because I wanted the FIREPROOF rating of the safe and ease of assembly and moving in, NOT because I had valuables to protect. That’s the bad part about buying a heavy duty home safe, some big brutes have to deliver it and they know where you live. There are a lot of reasons to like this closet vault from SnapSafe, but let me go down the list of why I bought one. Weight: At over 300 lbs empty, it’s manageable for me to install yet heavy enough when loaded down to make it more than “valuables with a handle”. Fire Rating: This “fireproof” safe has a better fire rating than most any other home safe you will find and better than safes many times its cost. I’m trying to protect paperwork that is valuable to ME even though its not valuable in a financial sense. Big Enough: While this safe won’t hold an arsenal, it will hold a few long guns, hand guns and still have room for some cash, gold, computer media in a media box, etc. Fast Access Lock: The 6 number combination push button electronic lock means you have quick access to your firearms. Bolt Down: There are two pre-drilled holes in the bottom to bolt down to the floor. I contacted the manufacturer and was told I can drill through the back to secure it to the wall for additional security without impacting the fire rating. Self Installation: No local delivery people were required to bring it into my home. Bolt Together: Carry it piece by piece into a basement, attic or other hard to get to place and easily assemble. No fancy carts or dollies or friends required. Sounds pretty good, huh? And all for less than $1000? OK, just something to think about. 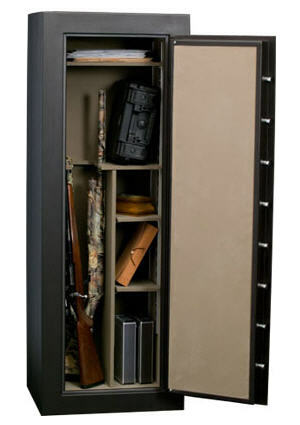 There are two ways that you could suffer a loss via theft with this Titan Closet Vault. Someone can pry, tear or cut it apart on site. Or guess the combination, or maybe find out the combination. They can remove the entire safe and take it with them (at full weight, including contents). What if you had stored some gold under/behind the fire proof panels in the safe, remember, it’s bolt together and you put it together? This would not be quick, easy access to your gold, silver or cash (cash would then NOT be in the fireproof protected portion of the safe), but a thief probably would NOT find it on site, and they may discard it with the safe to where you COULD potentially recover it if they disposed of the safe after opening off site and recovered by law enforcement. Just an idea to get you thinking. The list of what I don’t like about this home fireproof safe and gun vault is pretty short, but nonetheless I wanted to point them out. First, a trivial item. The foam used to pack the parts is the kind that leaves those little white styrofoam “crumbs” all over and they static cling to everything! Second, no pre-drilled holes in the back of the safe. A tall, thin safe bolted to the floor seems like it could be its own “lever” to pry it from the floor. Yes, you can drill your own but I always hesitate to do something like that. Third, and this is the biggest to me. It comes with a SecuRam electronic digital combination lock instead of the S&G (Sargent and Greenleaf) lock that the now discontinued Little Titan SnapSafe came with. I have read good things about the SecuRam as far as the lock itself goes, but look at the photo at right: The letter-to-number placement for mnemonic combinations is not “Standard”, like on a telephone keypad. That means that the same “password” that opens my Little Titan does not open my full size Titan Safe. Further, as both S&G and SecuRam have a lockout for invalid attempts, it’s nice to have the “cancel” button feature on the S&G (press ‘*’). On the SecuRam, ‘*’ and ‘#’ do nothing. (You press ‘#’ on S&G when finished with the combination. Additionally, with S&G, you can press as many buttons as you want PRIOR to the 6 digit code to fool/confuse anyone else nearby when opening. And, finally, the battery is easier to change on the S&G (drawer slides out bottom of lock) vs CAREFULLY sliding entire lock head off of safe and not damaging cable – then wrapping cable up in back of lock head to place back on safe. Fortunately the batteries last a long time. Since this home safe has a great fire protection rating you might find yourself wanting to store documents in it too. For that purpose you find it useful to have an extra shelf (I have mine on the top “notch” about 3 1/2 inches from the top). Just enough space for file folder, passports, you name it. Minus the disappointment of discovering that the electronic lock was not the tried and true S&G lock that I am used to, I am very happy with the full size SnapSafe Titan Closet Vault fireproof home safe and gun cabinet. The price is right, the features are right and it is made quite well and easy to assemble. I did not need to watch it, but there is a video online at the manufacturers site if necessary for assembly. All of the parts have a label on them so you won’t get confused putting it together. Just couldn’t be any easier.